Amazon today announced a brand new Fire HD 8 tablet, which keeps the name of the Fire HD 8 from last year, but brings a series of improvements and new features that customers will most probably appreciate. As previously rumored, this new Fire HD 8 tablet has more RAM (1.5 GB vs. the 1 GB found inside its predecessor), and is powered by a quad-core MediaTek processor clocked at 1.3 GHz. The device also offers more storage space, coming in either 16 GB, or 32 GB variants, both supporting microSD cards up to 200 GB. Sporting an 8-inch IPS display with 800 x 1280 pixels, the latest Fire HD 8 further offers stereo speakers with Dolby Audio, a VGA front-facing camera, and a 2 MP rear camera. The tablet runs Fire OS 5 (a forked version of Android), and packs a 4,750 mAh battery that can provide "up to 12 hours of mixed use." 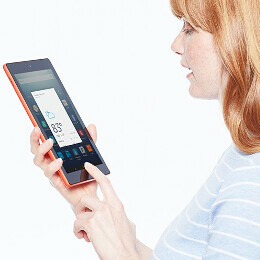 The Fire HD 8 will become the first tablet to support Alexa, Amazon's own cloud-based intelligent personal assistant. Thus, you'll be able to use your voice and interact with the Fire HD 8 in many ways, asking it to play music, read audiobooks, open games, search the web, and more. The new slate will gain Alexa capabilities following a software update that should be released later this year. The update will also be available for the Amazon Fire, Fire HD 10, and the Fire HD 8 2015. Amazon says that, according to its tumble tests, the new Fire HD 8 is "2x more durable" that the Apple iPad Mini 4. That may very well be true, but, in all seriousness, the Fire HD 8 is no match for the powerful iPad Mini 4, which is why it's about $300 cheaper. Pre-orders for the new Amazon Fire HD 8 are available starting today, September 8. The tablet can be had in four color options (black, blue, magenta, and tangerine), and costs as low as $89.99 (16 GB), or $119.99 (32 GB). The slate will be shipping on September 21. Any buyers here? I would never buy an Amazon tablet with that screen resolution, I need at least a 1080p screen for clarity and sharpness. Amazon is beginning to look like a joke, if Kobo eReaders had access to the Amazon Kindle Unlimited book selections, I would purchase one instead of Amazon eReaders. Thank goodness we have the Kindle App, but when is Amazon going to get around to updating the app to sync with the Android Good reads app, like Amazon has done with the iOS app. I really don't get it. Are any of the new tablets 1080p screens? Durability is a major factor in still buying a tablet in 2016. So I give them credit for making a literally solid device.